I was reared in the north suburbs of Chicago and attended college a short two and a half miles from my childhood home (go Wildcats! ), so when I had the opportunity to do a summer apprenticeship at an eco-tourism company in Alaska, I immediately said “yes.” I fell in love with the greater Pacific Northwest; after college, I worked seasonally in Alaska and Oregon, integrating the values of simple living and ecojustice. 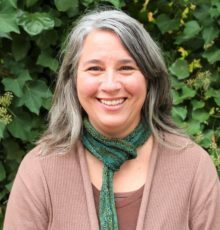 I eventually settled down on the rural Oregon Coast where my career turned to education – as violence-prevention and anti-oppression specialist for a non-profit organization, and, after receiving my M.A. at Portland State University, as a community college writing and English instructor. I was also a founding board member and volunteer for a community arts center, where I organized events, networked people, and supported local culture. After moving to the Portland area in 2015, I helped found the Clackamas County chapter of Showing Up for Racial Justice (SURJ), which deepened my work in racial and social justice. Joining JVC Northwest in the fall of 2018 is a natural progression of a life working toward healthy relationships, equity, and social and ecological justice. I’m humbled by the opportunity to connect with the greater JVC network and to work with like-minded individuals trying to create a better world. Want to contact Nancy? Email her or contact them at 503-335-8202.